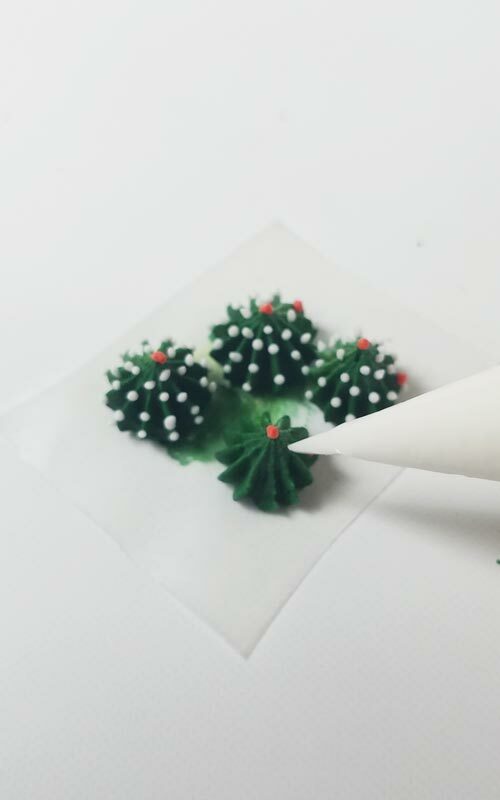 Mini Royal Icing Succulents are perfect for cookie decorating. They can jazz up the most boring projects. I have a feeling succulent trend will live forever. From decorative house plants, wall art, jewelry to cakes and beautiful cookies. 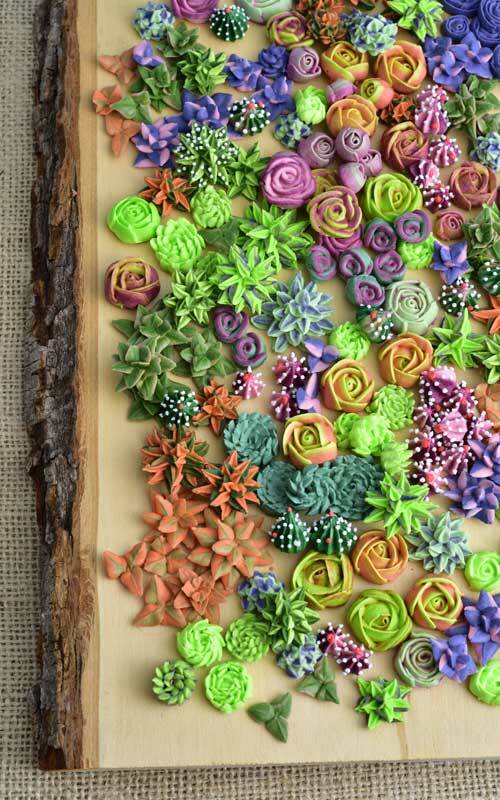 I’m completely enamored by succulents in the sugar form. 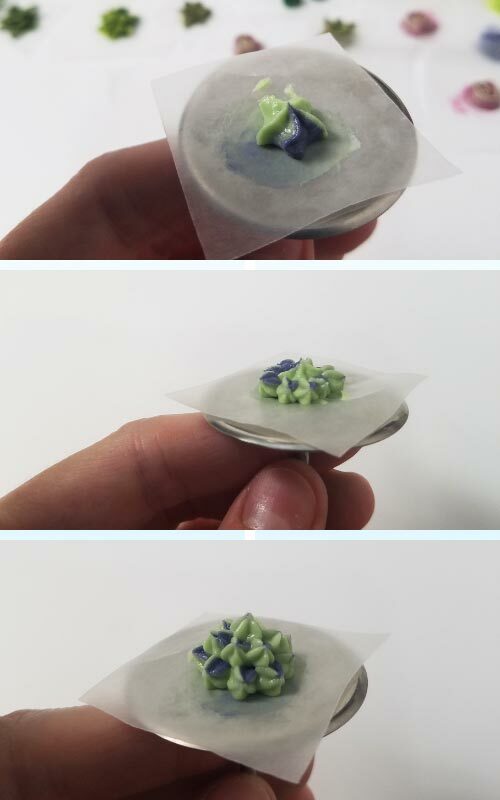 Today we are going to make mini Royal Icing Succulents. When making any piped flowers I highly recommend that you start with a fresh batch or royal icing. You can use leftover icing, that’s no problem. For best results avoid using previously frozen icing. Succulent plants grow in variety of colors. Mostly you’ll see them in wide range of greens, although there are some bright colored ones, too. Don’t be afraid to experiment and venture outside the box. Little splash of color is a great way to add some interested to your cookie designs. Go for yellow, electric green, white, red, purple, fuchsia, orange, gray-blue hues. Sky is the limit. Many of the succulents have variegated foliage. This simply means that the leaves are patterned or edged in different colors. To achieve this look we need to layer royal icing. Usually it is best to layer dark colors with a lighter shade of the same color or completely contrasting color. I will explain more about layering later. 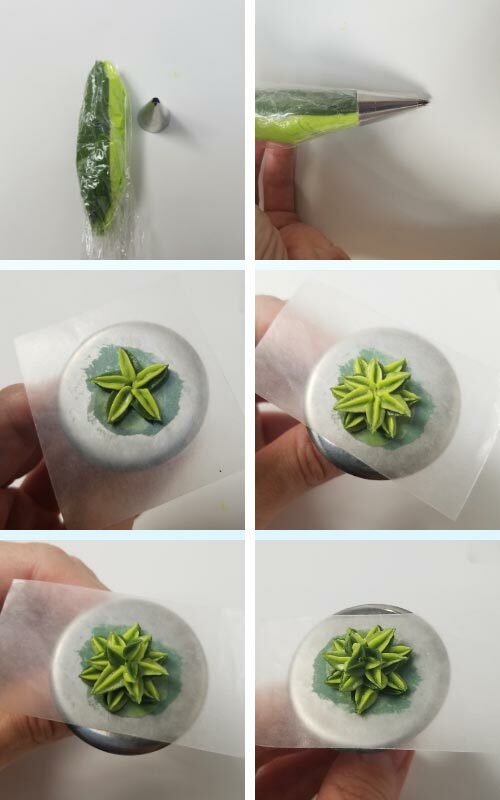 To make the royal icing pouches I use plastic wrap. 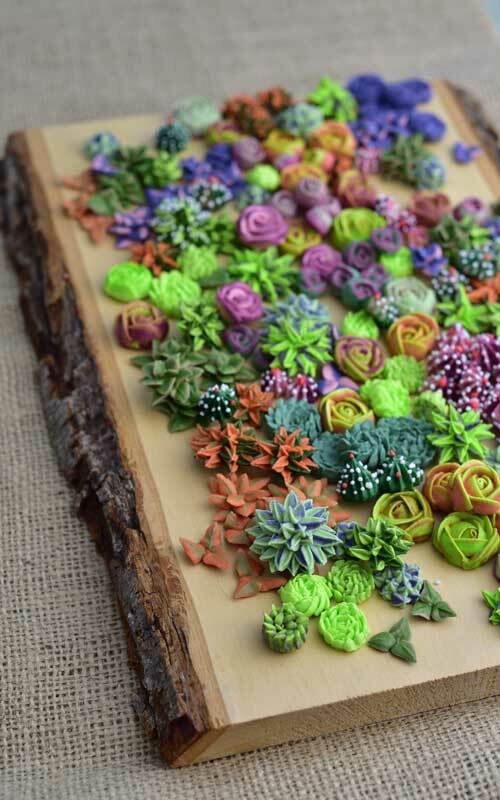 There are number of piping tips you can use to make stunning piped succulents. I used 6 piping tips. 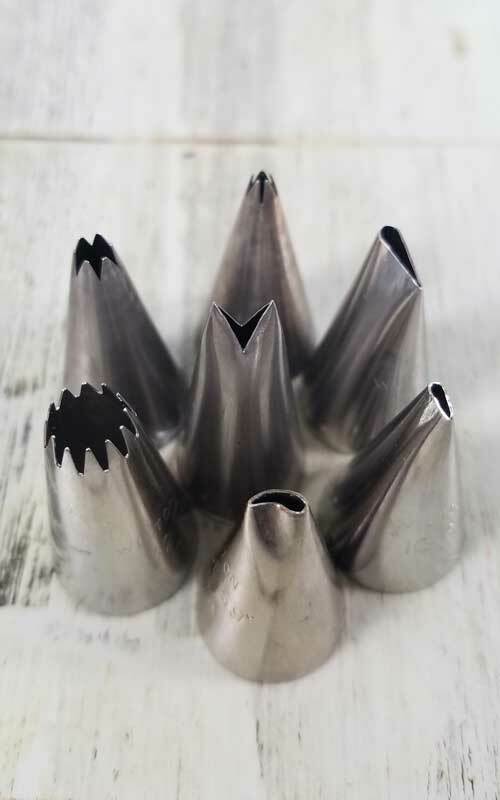 4 metal ones by Wilton: Tip #59, Star Tip #32 and #14, Petal Tip #101. 2 remaining ones were hand cut. Small leaf tip that I made by cutting the tip of the piping bag into a V shape and then a small round one. For the round one I just cut the tip of the piping bag. 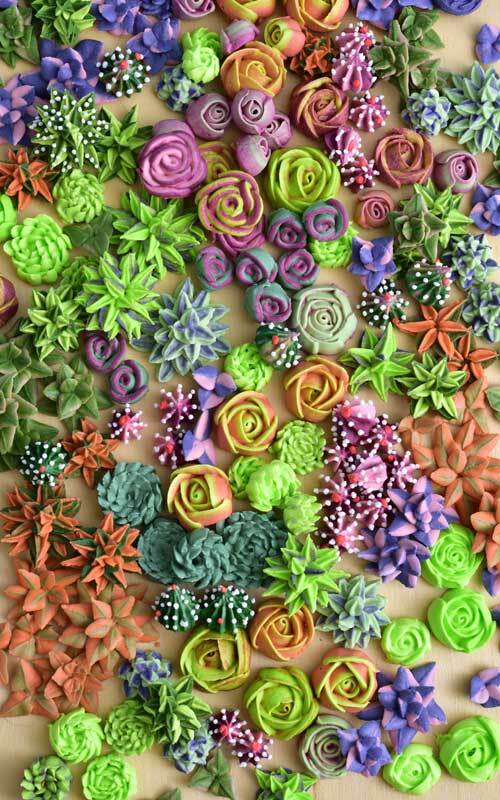 To make royal icing succulents you will also need a flower nail and lots of small wax paper squares. I always cut more squares than I need. It’s good to have some extras in case you need to practice piping or it doesn’t turn out and you have to toss a few. 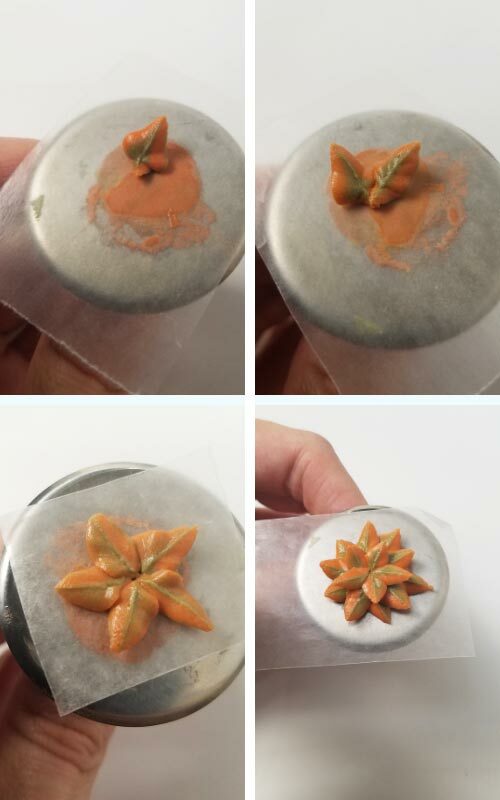 When piping variegated succulents it is important to check for the alignment of a piping tip with colored royal icing in the piping bag. For instance, if you look at the petals I piped in the below picture. Notice the outer edges are muted orange and center is green. 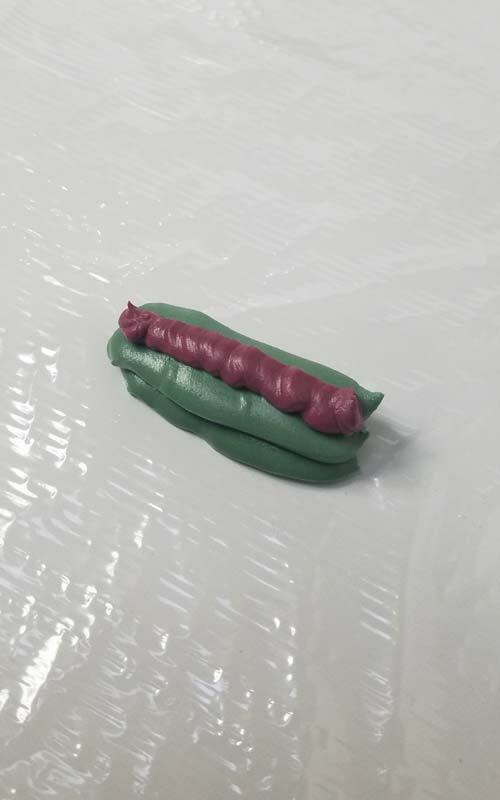 This is achieved by layering of colored icing and correct alignment of colored royal icing and piping tip. In the image below take a good look at #2. I layered pink green pink. 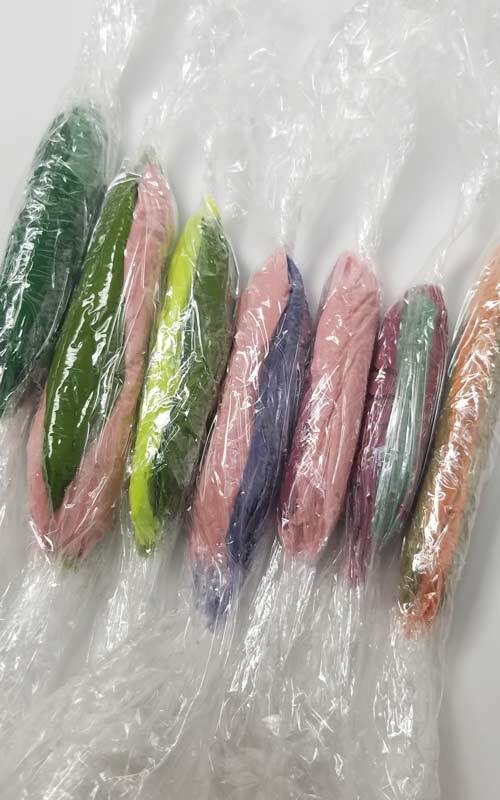 Same layering is used for the orange green succulent above except it is orange green orange. 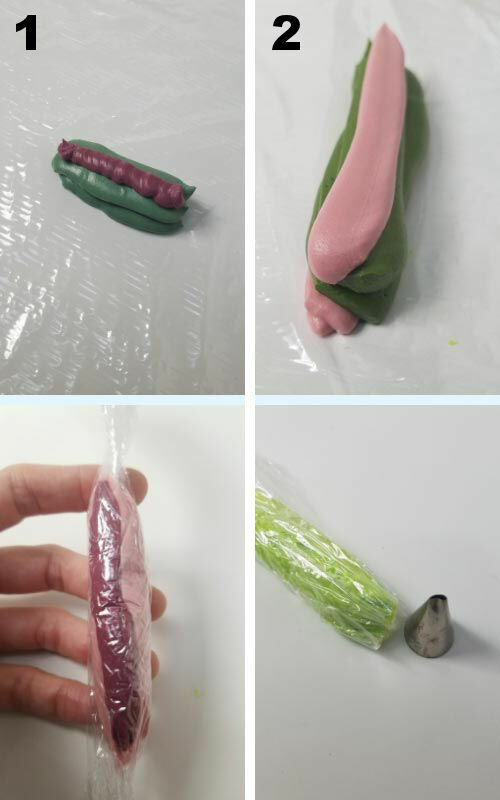 Then I put the layered royal icing pouch into a piping bag with a V shaped cut tip. I turned the pouch so 2 orange sides would be aligned with the leaf tip. 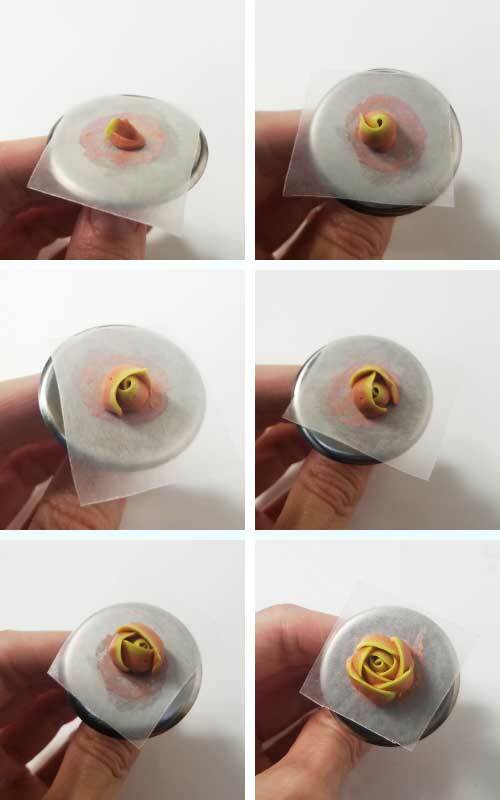 You can easily test it out by piping a few leaves. If the colors are coming out wrong you’ll need to adjust/turn the pouch until you are happy with your piped leaves. Roses are one of my favorites to make. For this one I used 2 colors. Bright green and muted orange royal icing. I aligned bright green with the narrow part of the tip and orange with wider part of the tip. Some succulents require few more details to be complete. Usually I add white and red dot once they are dry. 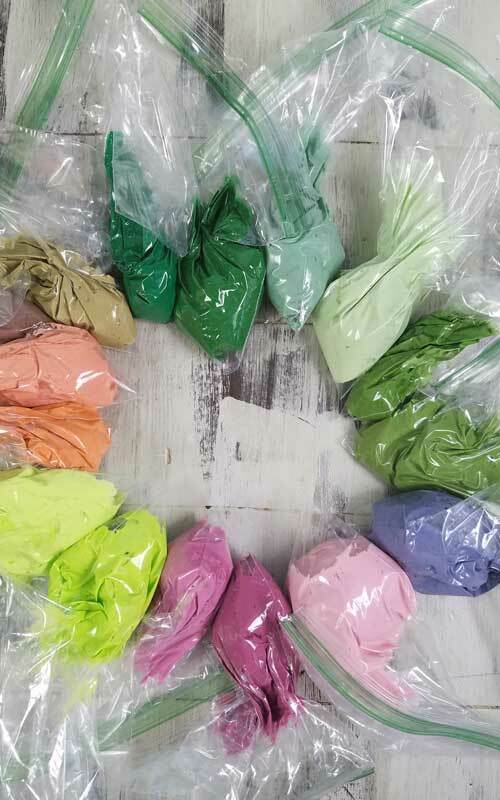 Mix and match colors to achieve the right you want. Use ivory and black to mute the colors down. For instance, to mute orange use some ivory or even a tiny bit of brown. Add little bit of black to green. Make bright green by adding little big of green to yellow. Mix together red and fuschia for deeper tones. Store royal icing succulents in an airtight container, in dark, dry place, away from a direct sunlight. 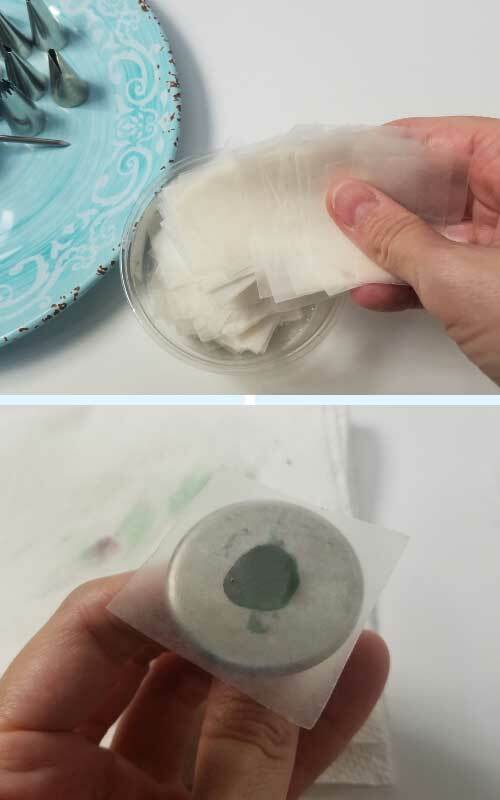 If possible add some food grade silica gel packets to help with absorb moisture, especially if you live in a humid climate. Rice also works well. 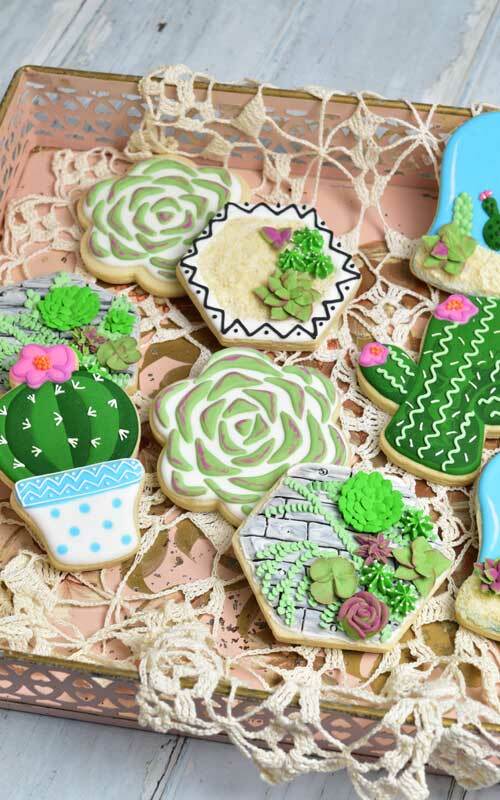 Now that you’ve made tons of mini royal icing succulents you can use them to adorn cookies. I made these last year and I have a grand idea for my new succulents, too. Don’t forget to sign up for the blog updates so you don’t miss it. For those of you who are enamored by succulents don’t forget to check out my beautiful Succulent Meringue Cake. This post contains affiliate links. Learn more about my affiliate disclosure here. That lime green is gorgeous! Can’t wait to see where these little beauties are going! That was a TON of work!